Upon the election of Abraham Lincoln to the Presidency in January 1861, southern states began withdrawing from the Union. South Carolina, the first state to secede, echoed the language and style of the Declaration of Independence in its Declaration of Secession. Eleven states eventually formed the Confederate States of America (CSA). President Lincoln did not acknowledge the CSA as a separate nation, but rather considered those states to be engaging in an unlawful rebellion. 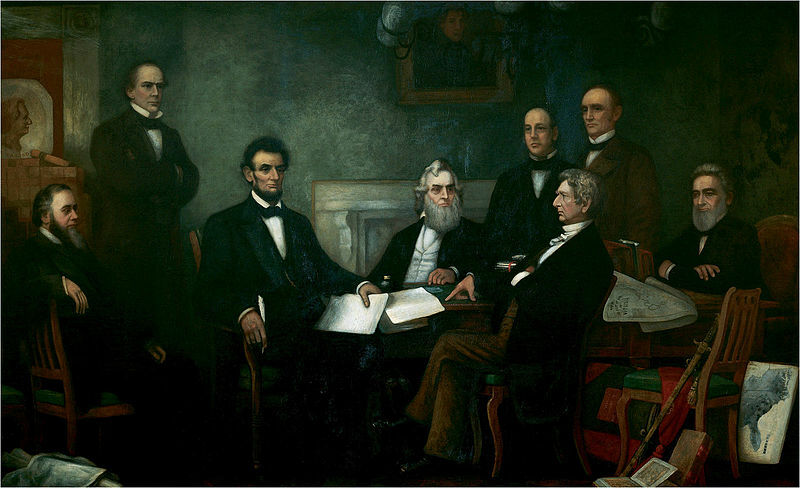 President Abraham Lincoln reads the Emancipation Proclamation to his Cabinet. Two years into the Civil War, Lincoln issued the Emancipation Proclamation. He saw that northerners opposed slavery but were not generally willing to fight to abolish it; they were willing to fight for the Union, though. This was Lincoln’s strategy: to abolish slavery through defense of the Union. After the Civil War, Congress required that the southern states approve the Thirteenth, Fourteenth, and Fifteenth Amendments as a condition of their re-entry into the union. The Thirteenth Amendment (1865) ended slavery throughout the U.S. and banned it forever. It reads: “Neither slavery nor involuntary servitude, except as a punishment for crime whereof the party shall have been duly convicted, shall exist within the United States.” It was this amendment, not Lincoln’s Emancipation Proclamation, that put an end to slavery in the entire Union. Congress hoped to make protection of blacks’ civil rights permanent through the Fourteenth Amendment (1868) to the Constitution. The Fourteenth Amendment was a significant alteration of the practice of federalism. It dramatically limited the powers of states. Its clauses are known respectively as the Privileges and Immunities Clause; the Due Process Clause; and the Equal Protection Clause. The meaning of each of these clauses has been debated since the amendment’s ratification. For a time after the passage of these amendments, African-Americans voted in large numbers despite coercion, fraud, and intimidation. Beginning in the 1890s, attempts to disenfranchise African-American voters became formalized through the adoption of voting requirements such as literacy tests, property qualifications, and, later, poll taxes. These measures deprived large numbers of black citizens of their right to vote. The Supreme Court initially interpreted the Fourteenth Amendment narrowly. It held in the Slaughterhouse Cases that the amendment’s Due Process Clause applied the same limits to state governments that the Fifth Amendment’s Due Process Clause imposed on the national government. The “privileges and immunities” of citizens, the Court also held, were limited to matters involving national citizenship. Like all constitutional provisions and amendments, the significance of the Reconstruction amendments has not been limited to the time of their ratification. The significance of the Fourteenth Amendment over the last one hundred years cannot be overstated. The first time the Court was asked to decide if it meant that Bill of Rights protections applied to the states, it said no. Beginning in 1925 with Gitlow v. New York, the Court decided that it did some of the time. The Court began to use the Fourteenth Amendment to selectively incorporate (or apply) some sections of the Bill of Rights to state governments. Though the idea may have surprised many people in 1868, over time many began to view the national government, and not state governments, as the primary protector of their rights. Further, as the definition of “rights” began to be changed by those in power during the Progressive Era, this new role for the federal government set the stage for a dramatic increase in its size, scope, and power.